(CNN) -- The social networking site Twitter again stole a march on traditional media when it was the first outlet to publish dramatic pictures of the Turkish Airlines crash. iReporter Laura Eekhos went to the crash site after hearing about it on TV. The area "was swarming with people from our town," she said. Moments after the plane crashed at Amsterdam's Schipol airport on Wednesday morning the news was appearing on Twitter, CNN International correspondent Errol Barnett said. "This is a story that broke on Twitter first and continued to unfold from there. Eyewitnesses were posting comments about the shock of seeing the plane 'dive' and amazement of passengers walking out of the wreckage," Barnett said. 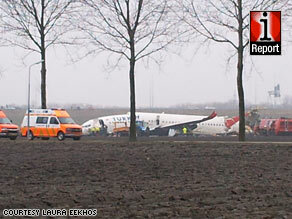 Barnett said that when CNN saw the image it moved quickly to confirm with Dutch officials that a crash had happened. "Within minutes we were reporting on the story. "We make a concerted effort to reach out to people posting on the Internet to verify what they say matches up with official accounts."